Vancouver Island Travel & Tourism: Suddenly Sasquatch Now on at the Muse Winery Don't miss it! Suddenly Sasquatch Now on at the Muse Winery Don't miss it! Dejected Amelia feels something is missing in her life. She lives at the bottom of Mount Douglas (about 100 years ago) and is bored silly. Her mother is pressing her to marry a weep from Vancouver named Roderick, who is being forced by his domineering mother to marry Amelia. Roderick has the hots for Lila, a maid. Amelia's dad has Alzheimer's Disease. It gets even more zany! A professor chasing the elusive Sasquatch thinks everyone else is nuts and invites himself to stay at Amelia's on the eve of the wedding. Amelia's mother is an alcoholic. Amelia's over-sexed nanny shares stories that shock the innocent Amelia! Then Amelia suddenly meets a Sasquatch who lives on Mount Douglas, who is passed off as Nanny's cousin Harold from Sooke. Wait, there is more....this is a musical! This whimsical and absolutely hilarious love performance is playing now at the Muse Winery in North Saanich (11195 Chalet Road). 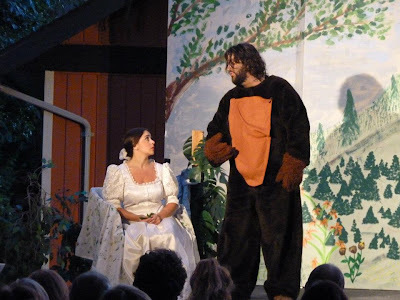 The play was written by Sasha Moriaty-Schieven and uses music cleverly adapted from many sources and previous musicals such as Sound of Music, Girl Crazy, Guys and Dolls, Beauty and the Beast, Batboy, and All Shook Up. The cast and crew of Peninsula Players did a masterful job of entertaining a sold-out opening night crowd at Muse Winery's great outdoor theatre venue. There were stellar performances and lots of laughs from an appreciative audience. The rousing finale of Burning Love from All Shook Up brought the audience to its feet with a standing ovation. Additional performances are scheduled for July 28, 29, Aug. 11 & 12. When word gets around, they will bound to be sold out, so make your reservations soon. If you want to make the evening even more special make a reservation for dinner ahead of the 7:30 PM performance. The buffet dinner included two choices of soup, bread and crostini, unique salads, prawn cocktails, hot entrees, and delicious desserts. We also enjoyed some award winning Muse Winery wines. This was truly a pleasurable experience that we whole-heartedly recommend. If you have not been to the Muse Winery you are missing out. There is no better time to visit than during the warm summer days. If you can't make the play, then go out for lunch. For more details visit the Muse website and the Peninsula Players Website. For more pictures please go to my Facebook page.